- Publisher Are you a mom? Do you know some moms? They are the busiest human beings on the planet, especially at certain stages of motherhood. 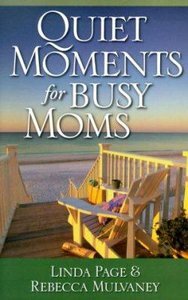 In "Quiet Moments For Busy Moms", Linda Page and Rebecca Mulvaney offer ninety cheerful and well-written reflections to give their fellow busy moms inspiration and a few restful moments. About "Quiet Moments For Busy Moms"
Are you a mom? Do you know some moms? They are the busiest human beings on the planet, especially at certain stages of motherhood. In "Quiet Moments For Busy Moms", Linda Page and Rebecca Mulvaney offer ninety cheerful and well-written reflections to give their fellow busy moms inspiration and a few restful moments. Page has taught special education for 18 years.